JASON JACK MILLER: Mega-Author Signings in Uniontown! 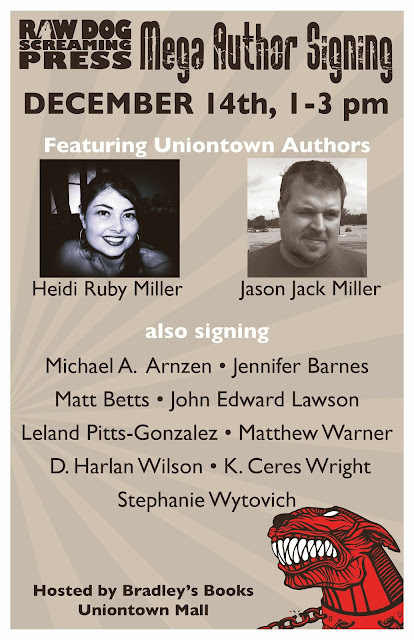 On Saturday, December 14 from 1:00 - 3:00 PM, Bradley's Books at the Uniontown Mall will host a book signing for 13 authors from Raw Dog Screaming Press and Dog Star Books, including Michael Arnzen, Jennifer Barnes, Matt Betts, Leland Pitts-Gonzalez, John Edward Lawson, Heidi Ruby Miller, Jason Jack Miller, Diane Turnshek, Matthew Warner, Albert Wendland, D. Harlan Wilson, K. Ceres Wright, and Stephanie Wytovich. The authors are also guests at Share the Spirit that evening at the State Theater Center for the Arts in downtown Uniontown. The Share the Spirit Author Mix and Mingle begins at 6:00 PM.